The Campus A10 was among the 3 devices that Celkon unveiled a few days back. The phone comes with decent specifications for a device costing just over 4,000 INR, and would try and compete with other low cost phones from makers like Micromax and Intex. Celkon is among the newer domestic manufacturers, and the company shot to fame with a series of TV commercials featuring popular cricketer, Virat Kohli. Coming back to the device, it comes with a rather small screen of 3.5 inches. However, you can’t really complain when you get a dual core phone for a cost as low as 4199 INR. You can’t really expect a sub-5k INR phone to offer you a 5MP or an 8MP camera. The Campus A10 does nothing unusual, and comes with a set of cameras that you would expect on a relatively cheap device. The phone features a 1.3MP rear camera and a VGA front. The big plus on this device is the presence of 3G support, which means that you can use the front camera for video calls even on your cellular wireless network. You shouldn’t expect the 1.3MP unit to be miraculous; the unit is assumed to be a fixed focus one, so the most you can probably do with this unit is casual photography. Do not expect pictures to have any sort of depth or immaculate colour balance. The phone features 256MB of RAM as you would expect on a low cost dual core phone. ROM capacity on the Campus A10 is set to just 512MB out of which a major hunk would be taken up by the Android OS and another one reserved for apps. You can expect the user available memory to be somewhere around 100MB on this device. However, the phone comes with a microSD slot, which means the internal storage is expandable by up to 32GB. While most manufacturers are rolling out devices with quad core chipsets from MediaTek and Qualcomm, Celkon choose to go the dual core route. And it actually makes sense, since we believe there is still a market for cheap dual core phones in the country. The Campus A10 comes with a dual core processor which is believed to be the MT6572 from MediaTek. This moderately powerful processor is coupled with 256MB of RAM, which, quite honestly, isn’t quite enough for today’s style of usage. The device will not be the fastest to boot, and launching apps might take time. Also, do not expect the phone to be the best multi tasker. However, if your style of usage doesn’t involve multi tasking and gaming/multimedia, the Celkon Campus A10 might actually be a good choice for you. The phone features a 1500mAh battery which should take you through one day, thanks to the screen which is relatively small at 3.5 inches. As mentioned previously, the phone comes with a 3.5 inch screen. In an age where the average screen size is slowly tending to 5 inches this does feel like a very small phone. Nevertheless, devices like this one have their own market. The phone packs a resolution of 480×320 pixels. You can probably execute tasks like email, chat, browsing without much hassle but multimedia (especially movies and games) will not be enjoyable on this phone, because of (1) the small screen, and (2) low resolution. The fact that the phone comes with a front camera and 3G is an added advantage. Another good thing is that the phone comes with Android v4.2 pre-installed, which should help in lowering the battery consumption and allow for greater app compatibility. The phone looks like any other budget phone in the market with its candy bar design. Thanks to the small screen, the device will be among the more mobile and useable devices in the market, and would fit in even the smallest pockets. On the connectivity front, the phone comes with the regular features like WiFi, Bluetooth, etc. and additionally features 3G as well. 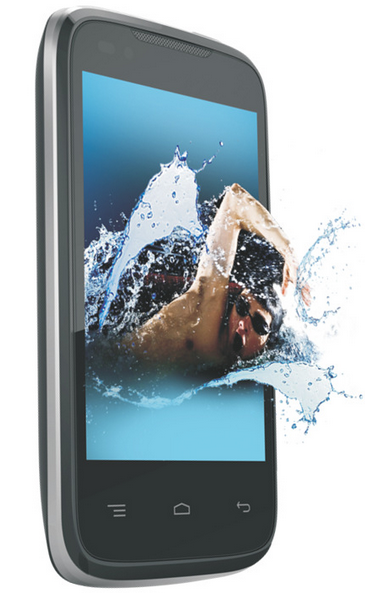 The phone can be compared to innumerable other low-cost dual core phones from domestic manufacturers. However, some devices like Karbonn Star A9 and A8, Spice Stellar Glamour, etc. might be bigger threats than others. It is fairly easy to make out that the phone isn’t a very innovative device, but at the same time, the phone gives you every feature at a very low cost. THe presence of 3G support is definitely a big plus, and the device will make a decent one for people looking to have a taste of Android. Potential buyers can include students, housewives, or anyone who’s on a relatively tight budget.